Paula J. Mann was born in a small town in Italy in 1973. She graduated from the Art Institute of Perugia (Italy), and following her artistic background, she started to write novels. None of those was meant to be published, until one day, encouraged by one of her best friends, she decided to share her stories with the rest of the world. She likes to tell stories about what she observes around her. She loves travelling and photography, from which she gets her inspiration. A Tale of a Rough Diamond by P.J. Mann is a gripping thriller, suspenseful and riveting, a tale of envy, of brokenness in a family, and brothers pitted against each other. Stephan Mills lives the kind of life many would envy, the life of the son of a wealthy man. His older brother, Roger, is very envious of the attention their father gives Stephan and, using his connections with the Russian mafia, he succeeds with just one tip-off to the police that lands Stephan in prison. Now he has all the cards and he plays them well to ensure he turns their father completely against Stephan. And he succeeds! Stephan won’t be hearing from his family for a year — and it is just according to Roger’s plans. Can Stephan recover from the rejection and get his life back on track? P. J. Mann has written a hugely entertaining novel filled with family drama and relationships gone bad. It’s a tale of envy, betrayal, and revenge. How far will the two brothers go to break each other and can this family discover trust once again? The psychological underpinnings of this novel are strong and readers will get pulled into the strong whirlwind of the conflict, the depth of character, and the deviousness of the plot. The scenes are well crafted and they are emotionally rich. Mann understands the dynamics of a wealthy family and the kinds of problems they face, and weaves this knowledge skillfully into the narrative. The writing is compelling, the narrative voice irresistible, with points of view that are expertly handled. 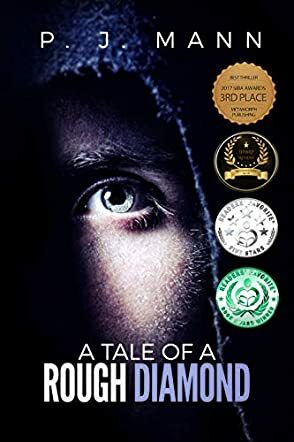 A Tale of a Rough Diamond is fast paced and it features an explosive conflict between two brothers.